April 10, 2019— For far too many patients in the U.S., access to needed health care is often out of reach. Millions of Americans – including those who live with disabilities, those with lower incomes, and members of racial and ethnic minority groups – struggle to get needed care. But hospitals participating in the 340B drug pricing program are helping counter that trend by providing comprehensive care for many of those who have been medically underserved in the past. A body of research has documented the impact of care barriers. Disproportionately larger portions of these populations have less access to care, higher incidence of chronic illness, and poorer health outcomes. The combination of these factors can lead to a vicious cycle for many people who are struggling to get healthy and stay healthy. One bright spot in this picture comes in the form of our nation’s safety-net hospitals. A new L&M Policy Research report commissioned by 340B Health finds that hospitals participating in 340B are treating larger shares of these vulnerable populations compared with hospitals that don’t participate. The same holds true when 340B hospitals are compared with private physician offices. Significantly higher percentages of patients treated by 340B hospitals are African-American, are disabled, or are living with such low incomes that they are eligible for both Medicare and Medicaid. In several areas, the comparison is quite stark. For example, the percentage of patients at 340B hospitals who are African-American is two-thirds larger than at non-340B hospitals. The portion of 340B hospital patients who are disabled is more than twice as large as it is for those treated in physicians’ offices. 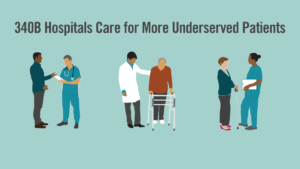 Our nation’s safety-net hospitals clearly are meeting a great need for care among the underserved. Congress created 340B to help safety-net hospitals, clinics, and health centers stretch their resources to serve more patients and offer more comprehensive services. Savings from discounts in prices for outpatient drugs help these providers to do just that. Prior research has documented that 340B hospitals provide 60 percent of all uncompensated care in the U.S. while representing only 38 percent of acute care hospitals. 340B hospitals are much more likely to provide vital health care services for people living with HIV, those dealing with mental health or substance use disorders, and other chronic conditions. While the latest figures in this report may come as news to some, they will not be a surprise to the dedicated health professionals working at our nation’s safety-net hospitals. Their steadfast commitment to their patient missions has its heart in the concept of providing the best care for every patient, regardless of their life circumstances or their ability to pay. It reinforces the great success story that is 340B and provides a vivid demonstration of how program savings are going exactly where they are needed the most.